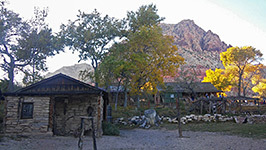 Spring Mountain Ranch is a small state park entirely within the much larger Red Rock Canyon National Conservation Area, attractively situated on a broad desert plain less than half a mile from the edge of the colorful Spring Mountains, and accessed by a short spur off Highway 155, Blue Diamond Road. 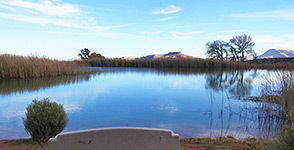 The surroundings are arid and sparsely vegetated, but the property sits alongside a seasonal stream (Sandstone Spring Wash) that flows from the mountains, enhanced by a nearby spring, and the relatively plentiful water sustains a reservoir, abundant shady trees and three sizeable pastures. 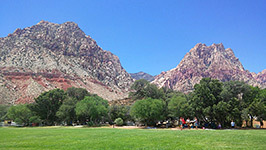 The park has five loop trails, the longest only 1.4 miles, but it is mostly popular for viewing the various historic buildings, and for picnicking - the ranch is about 2,000 feet higher in elevation than central Las Vegas, and the prevailing temperatures are 10 to 15 degrees (F) lower, so the shady woodland is an ideal refuge during the hot summer months. Entrance fees (2019) are $9 per vehicle. 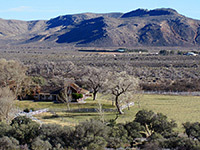 Sandstone Ranch was established in 1876, initially as a working farm, later as a guest lodge, and has changed ownership several times; some of the more famous occupants were Howard Hughes, the actress Vera Krupp, and comedian Chester Lauck. 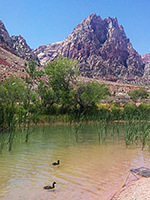 One of the earliest pioneers associated with this location was mountain man Bill Williams, also remembered for a river in Arizona. 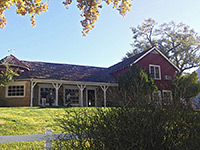 The state park contains a modern visitor center and over a dozen historic buildings, the oldest (Sandstone Cabin and Blacksmith's Shop) dating from around 1864. 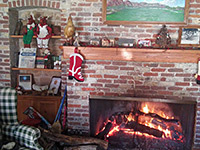 Other structures include a workshop, cemetery, barn, corral, two bunkhouses and several guest houses. Some are open without restrictions, some may be viewed on guided tours, while a few are closed to the public. All the old buildings are situated close together so can be viewed, at least from the outside, in just half an hour or so. The park stages regular historical re-enactments and demonstrations of pioneer skills. Just west of the ranch buildings, Lake Harriet is a pretty reservoir, lined by reeds and trees, with a small island in the center. 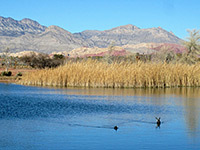 The lake is home to a small population of the endangered Pahrump poolfish. 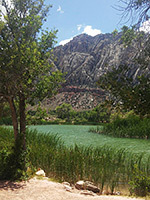 The best view in the park is looking across the blue waters of the lake and the green vegetation around the edge towards the reddish slopes of the Spring Mountains just beyond.The main picnic area is on the east side of the ranch, at the edge of one of the three green fields (South Pasture). Also within the park is the Super Summer Theatre, an outdoor venue for plays and musicals, staged in the evenings between May and September, again with the mountains as a scenic backdrop. Shortest of the five trails is the 0.3 mile North Ash Grove Loop, which passes through a small group of trees on the north side of Sandstone Spring Wash. The 1.4 mile South Ash Grove Loop crosses the creek then encounters similar scenery on the opposite side, extending for a time into more arid terrain. The 0.4 mile Lake Harriet Trail loops all around the shoreline of the reservoir, while the Overlook Loop (0.8 miles) winds across mostly treeless, slightly elevated ground on the north side of the ranch, and also has good views of the mountains. The Sandstone Canyon Loop starting on the far side of Lake Harriet is a 1.2 mile circuit that follows the creek upstream, partly over stony hillsides and partly in the wooded corridor of the stream, and reaches Sandstone Spring, source for most of the water. The spring is right at the edge of the mountains; tall, fractured cliffs rise steeply overhead, and the drainage can be followed, off trail, for at least another mile relatively easily.